Love seeing all the different patterns and makers that everyone gets. Awesome knives Doug, thanks for posting the photos, and thanks for the kind words. I collect what's familiar, my walls are covered with my family's 100+ yr old hand tools, most of them used by me as well, and my most treasured knives are those I inherited from passed relatives, or those I bought in my youth and still use today. I like to think that a tool retains something of it's former user(s), and the ones I appreciate the most are hand worn from use yet still rugged and useful; like the knives I prefer to collect. I enjoy not only the knife, but the history it contains, both in it's manufacturing origins and from it's past owners. Though I would love to own what I refer to as a "Gucci" knife, that really just isn't me. I'm just a working guy who appreciates industrial art in one of it's finest forms, namely the form of a good slip joint pocket knife, which I believe are wonders of industrial ingenuity. I insist on actually using each and every one of my knives at one time or another, so that when they go down to my family they will know the wear they see on them was from my hands, (or my brother's, dad's, grandfather's, great uncle's, etc, etc); that means more to me than all the art knives in the world. Don't get me wrong, I don't like junkers, or knives with reshaped blades for example, but a few dents, dings, or a bit of "patina" doesn't bother me a bit. That's the point, collect things that are old, used and show their age.......just like me. The Queens and GEC's certainly are some very nice knives and that Northfield Barlow is really outstanding. I'm not familiar with the fixed blades but they sure look like quality. Syd, you're the type of collector I really admire. I collect Schrades the way you collect Bucks. Finding that one rare knife that others have passed by is the best. Doing the research and reading that it takes to recognize the rarity of that Buck is no small task. Anyone with a fat wallet could have bought the D'Holder, Kious, Barnett, Rogers, Queen or GEC knives that I've posted here. I watched long and hard for the right deal to come along, but the fact remains that they are available. I guess I'm guilty of showing off some of the fancy ones instead of the real meat and potatoes. The knives below aren't near as shiny but they are some that I'm most proud of having found in 2015. Thanks for reminding me. italian handmade for SMG usa .... what a solid superdisign !! bought it for heavy outdoor use but i love it so much that i sometimes take it to dinner too !! Appears a well thought out .. stout & sturdy design. From the reliable & strong lockback ..to the.. smoothly contoured handle shape .. it exudes design excellence. The scale material ( ? ?canvas micarta?? ) provides an effective "grippiness" & is dmn near indestructible. "n appears contoured for comfort. I'm guessing one could actively use the knife for an extended period of time w/o hand/palm fatigue. The splines/grooves present & lock release & thumb rest areas .. obvious forethought !! Might I suggest .. a nice quality Doctor's Knife .. for implementation w/ the steaks. The only doctor's knife pattern that I'm familiar with is around 3 inches closed. I'm sure that isn't the knife you are referring to. How about a picture...educate me. My daughter's Queen #96 is about 3 5/8". It's not large, but would definitely be able to handle a steak in a pinch. 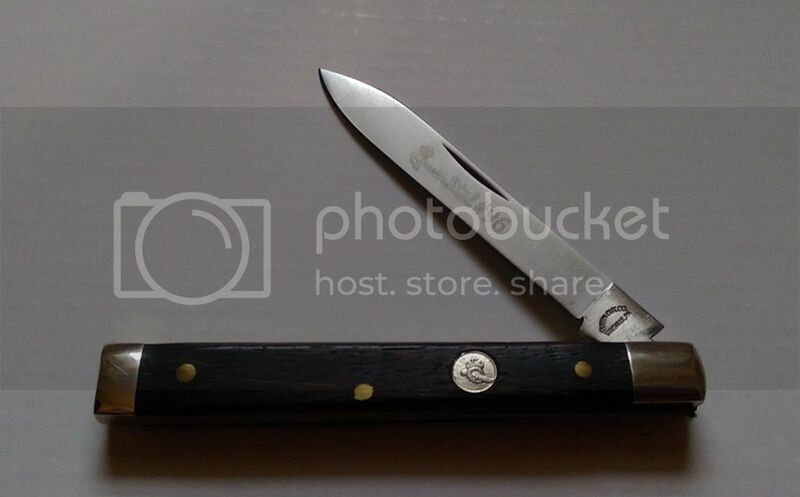 Are they GEC #77 knives old? And how hard are they to find and buy? Washington Jack #771214EC Smooth Polished Stag 49 pcs. Smooth Autumn Gold Bone 52 pcs. Gabon Ebony Wood 49 pcs. Blood Red Smooth Bone 51 pcs. SMOOTH IVORY BONE _ 62 PCS. SMOOTH BLOOD RED BONE _ 63 PCS. SMOOTH AUTUMN GOLD BONE - 68 PCS. COCOBOLO WOOD - 64 PCs. SMOOT'H IVORY BONE _ 43 PCS. SMOOTH AUTUMN GOLD BONE _ 4I PCS. The Schrade Cut Co 2203 3/4 and the Schrade Walden 2OT are 3-1/2" closed while the GEC Washington Jack is 3-3/4" closed. Charlie's SFO's' are highly colectble and this was a very popular knife. Most likely all the knives, about 750 total, were reserved by collectors prior to manufacture. A few knives from GEC's short runs would bounce around on the secondary market for 3 to 4 months after being released....usually at double or more the original cost... and then rarely be seen again as they had found permanent homes. Occasionally a collector will change directions and a few will pop up...I ended up selling 6 of the 7 I had...or hardship will dictate the liquidation of a collection. Doug is spot on with those. The Charlie 77's are a bit harder to find and usually a little higher but they were not the only 77's produced. 771116 SPRING GREEN SAW CUT BONE 114 PCS. BONE CANVAS MICARTA 120 PCS. COPPERHEAD SAW CUT BONE 172 PCS. 771218 Northfield Desert Ironwood 123 pcs. Natural Linen Micarta 136 pcs. Blood Red Sawcut Bone 125 pcs. Elderberry Camel Bone 128 pcs.